The man in the mirror is Thomas Jesse Cole, a third cousin of Frank & Jesse James. Though unrelated, Thomas Jesse Cole had much in common with the man looking into the camera. He is Orson Grimmet. 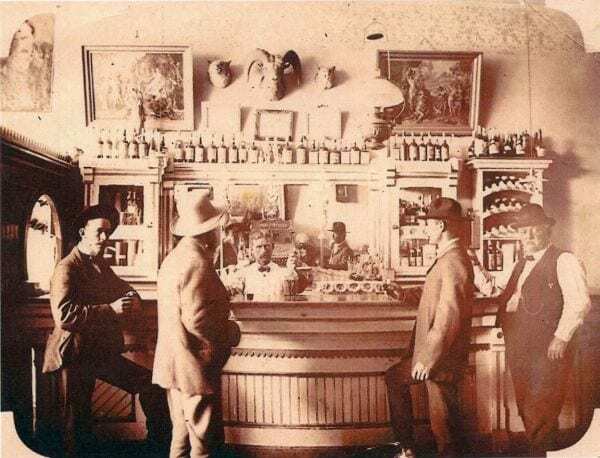 The two are standing at the bar in Grimmet’s saloon in Lander, Wyoming. Orson Grimmet was born in Birmingham, England in 1850. When five years old. He and his parents arrived in America and headed west. Over several years they wandered around Utah and Idaho, where his father died. 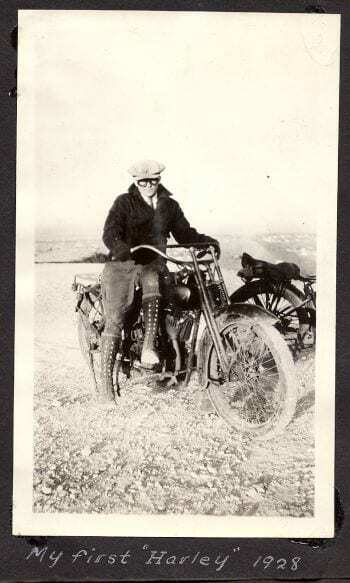 Orson’s mother moved on to Lander, Wyoming, where she died. Though twenty-five years younger than Grimmet, Thomas Jesse Cole found himself orphaned to his mother at age four. His father, Ben Cole, had become crippled by a knee infection after bringing his family to Brownsville, Nebraska from Missouri. The infection claimed him at age forty. Jeanette Cole moved on with her son to Litchfield, Nebraska, where she died shortly after arrival. In Lander, Orson became a stockman. He was elected Sheriff of Fremont County, serving two terms. He was active in Democratic politics, and invested in copper and gold mines. He belonged to the Benevolent Protective Order of Elks, and the Knights of Pythias. All the while, he worked each day in the saloon, that became his unofficial office. There, he met Thomas Jesse Cole. 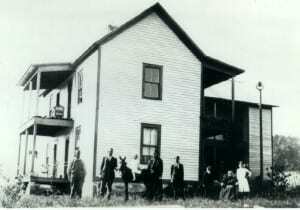 Sometime between 1893 and 1896, Thomas Jesse brought his wife and daughter to Lander. There, Orson Grimmet became a mentor to Thomas Jesse Cole. Unknown is whether the two were partners, or whether Orson was Thomas Jesse’s financier in his own saloon. 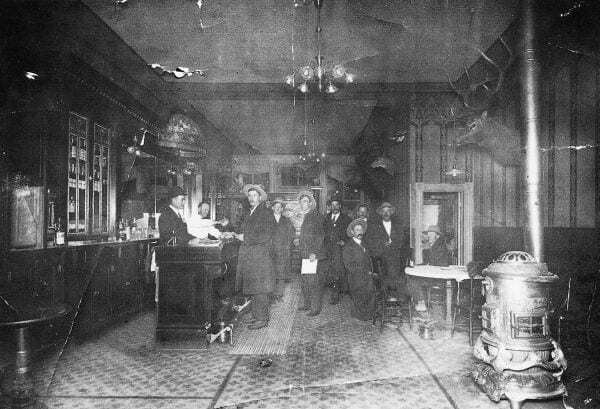 Thomas Jesse is pictured here, standing behind his bar. The pair remained friends. 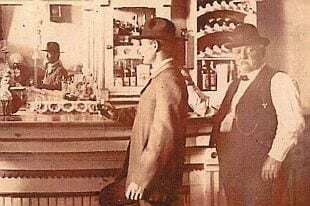 Both were acquaintances of Butch Cassidy, who frequented each their saloons. 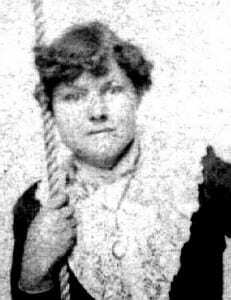 When Caspar, Wyoming elected Pat Royce sheriff, it was very likely Orson Grimmet who arranged the appointment of the daughter of Thomas Jesse Cole, Pearl May, as the first female deputy sheriff in Wyoming. In 1908, Thomas Jesse named his third son Thomas Orson Cole. Orson Grimmet died ten years later. Thomas Jesse Cole a decade after him. From the Phillip Cole Archive; The James Preservation Trust. RHODA MAY (1806-1889) is the stalwart spouse of the “talented, but erratic” Rev. Joseph Martin James (1791-1848). Rhoda withstood all transgressions, indignities, & social ostracism that her husband created with admirable Teutonic stoicism. When acute alcoholism took Joe’s life at age fifty-seven, Rhoda became a forty-two year old widow, left alone to raise nine children. For the next forty-one years of her life, Rhoda May James resolutely carried the social burden of her husband’s disgrace. 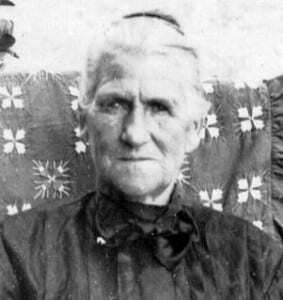 She watched as the Civil War divided her children and tore apart her family. She never remarried. Thanks to Gwen Smith-Gershwin, who is a fourth great granddaughter of Rev. Joseph Martin James & Martha McAlister, Joe’s first wife, this tintype image of Rhoda May now can be appreciated. The original tintype was handed down in the family through Rhoda Alice Owens-Cole-Dowell, Rhoda May’s granddaughter & namesake. Prior to the contribution of this tintype image to The James Preservation Trust, the only known image of Rhoda May was a framed oval colored photograph. This colored image still hangs in the home of Nelva Anne Herrin, a great granddaughter of Joe Martin & Rhoda May James. Nelva Anne’s contemporary home, built by her father Lem Garland Herrin, sits opposite the decayed ruin of the home built & occupied by her great grandparents Joseph Allen Herrin & Susan Harriet James on the original settlement lands of John M. James at Shopville in Pulaski County, Kentucky. Susan Harriet James is a daughter of Joe Martin James & Rhoda May. 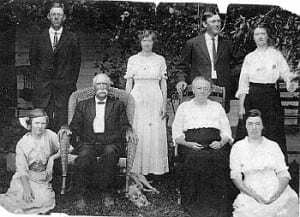 Edward Perry James & his family. Namesake Rhoda May James sitting at her father's knee. EDWARD PERRY JAMES (1847-1931) was only a year old when his father died. He grew up in his father’s stone house in Shopville, married Elizabeth Langford, & raised a family of nine children in the same house. His youngest child, he named Rhoda May James, after his beloved mother. Progressively selling off his land holdings in Shopville, he removed his family to a new home he built in Berea, Kentucky, where he died. SUSAN HARRIET JAMES (1843-1920) was five years old when Joseph Martin James died. 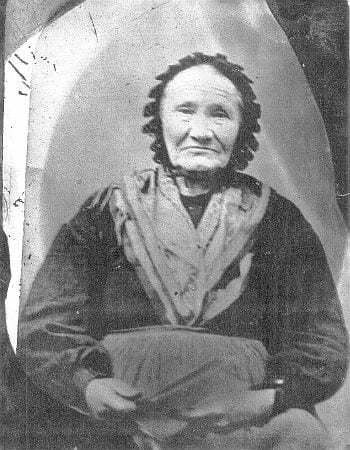 She was thirty years old when she married Joseph Allen Herrin, a Union veteran of the Civil War. In a diary Herrin kept during the war, he noted the wounding of Susan Harriet’s brother, Andrew James. Herrin was returned from the war for almost a decade, when he and Susan Harriet married in the home of Rhoda May. On the land of Susan Harriet’s grandfather, John M. James, in Shopville, the couple built themselves a new home. The home remained occupied by her descendants until about 1947, when the couple’s grandson, Lem Garland Herrin, built his bride, Thelma Hayes, a new home directly opposite the lane of the old home. Rev. MARTIN NALL JAMES (1833-1911) was fifteen when Joe Martin James died. He became a Baptist preacher, but not one like his father. At twenty-five he married Susannah Elizabeth Matthews. The couple elected themselves Baptist missionaries & migrated into Missouri. During the war, he fought on the Confederate side. The couple bore eight children. CYRENIUS WAITE JAMES (1831-1911) was age seventeen at the time of his father’s death He was Rhoda’s second eldest child. Cy bore witness to much of the abuse suffered by his mother. He and his other siblings also suffered the social stigma brought upon their family by their father’s bigamous third marriage to the youthful Permelia Estepp. 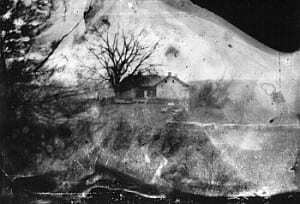 Though his half-siblings with Permelia lived in plain view across Flat Lick Creek, the two families remained completely estranged from each other. Cy fought for the Union in the war and was taken prisoner. In prison in Georgia, he awoke to a nightmare of his daughter dying, at the same time she choked to death on some corn In Illinois. Prior to the war he removed his family there. Afterward, he walked them to Texas, where his descendants live today. No picture of Cy is known to exist. 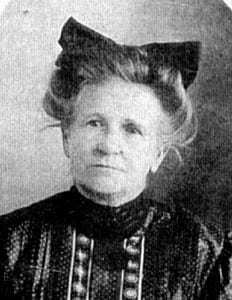 His daughter, Rhoda Ann James, named for his mother and shown here, operated his bank in Rhone, Texas. 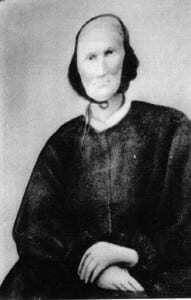 JOHN SMITH MAY (1835-Aft. 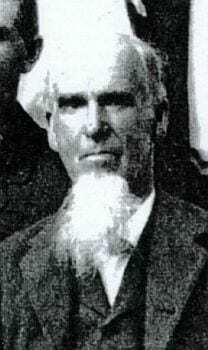 1891) was a farmer and a teacher before the Civil War started. Shortly after joining the Confederate Army he was captured & imprisoned in Ohio. After the Battle of Chancellorsville, he was exchanged. 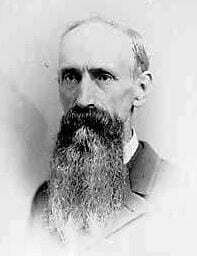 He joined John Hunt Morgan in Sparta, Tennessee, but was captured later again with Morgan, David Hunt James, & Richard Skinner James. He was secondly incarcerated at Camp Douglas in Chicago, but later sent to Virginia. He surrendered with Gen. Robert E. Lee at Appomattox. Afterwards he returned to Kentucky to resume teaching. By Elizabeth McQueary he had ten children and by Sallie Thurmond two more. In Pulaski County, he became Superintendent of Schools, the Court Clerk for the county, and was elected to the lower house of the Kentucky State Legislature. He and Rhoda May-James died within a few years of one another.